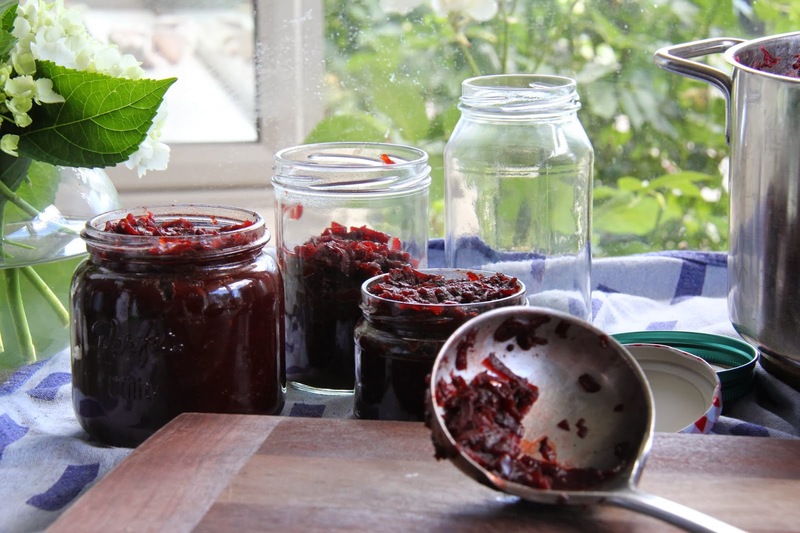 Whilst I am on a festive roll I think it’s time we had a chat about beetroot relish. Its a failsafe part of my Yule arsenal. I have given it numerous times as gifts to great accolades and have found it a saviour to have on hand to jolly up any summer entertaining efforts. The flamboyant red flesh is sublime in a meaty hamburger or it can add an intriguing twist to a cheese plate or bbq. I have even added it with equal parts sour cream to make a luridly pink dip. The only tricky part is grating and preparing the largish quantity of beetroot. Thankfully beetroot does not need to be peeled, just give it a good soak and scrub then away you go. As for the grating, I tend not to rely on gadgets, but a food processor makes this chore an absolute doddle. If you are going down the path of using a simple box grater, my advice would be to pop on a latex glove. Stained fingers aside, a sacrificial layer of skin when dealing with knuckle loving blades is always a good thing. The quantity given is on the high side, generally it tends to make 4 large jars, which is rarely an issue given the long shelf life and general deliciousness of the preserve. It truly is as simple as popping all of the ingredients into a big cauldron and boiling like mad. The time taken to boil into a thick mass is quite variable- the best indication of readiness is when your can swipe along the base of the pan and see a clear line that does not instantly fill with liquid. Most of the juices should be evaporated or become soaked up by the beets, err on the side of extra cooking if things are looking on the flimsy side. It does make your house smell like a pickling factory, but I quite like that, its just another little sensory reminder that happy summer days are not far away. The lively combination of beetroot, orange and fennel seed combine to make this gloriously coloured relish. It makes a wonderful accompaniment to festive cold meat and is marvellous to have on hand for summer entertaining. 1. In a preserving pan or your largest saucepan, mix together all the ingredients well. Bring to a gentle simmer, then cook for 1 hr, stirring occasionally, until the chutney is thick and the beetroot tender. 2. While the relish is cooking, prepare your jars by running through a short hot wash in your dishwasher. Or wash thoroughly by hand, and then put in a hot oven to sterilize for 10-15 mins. 3. Once the relish is ready, let it settle for 10 mins, then carefully spoon into the jars and seal while still hot. You can eat it straight away but it will be even better after a week or two. 4. Will keep for up to 6 months in a cool dark place. Once opened, refrigerate and eat within 2 months. The quantity given makes 4 large jars, the recipe can easily be halved to yield a more modest amount.